A manual for individuals and families providing information about the numerous decision making options available when an individual with a disability reaches the age of majority (age 18). An online course in Spanish with accurate information to assist individuals and families in understanding the range of option in guardianship. The Wallet Card is a free tool for teenagers and adults who have Autism Spectrum Disorder (ASD). It is designed to help them communicate clearly with law enforcement or first responders. The Age of Majority: Did You Know? Informative facts about turning 18. A helpful guide outlining considerations for individuals seeking an attorney to represent them in a guardianship proceeding. A quick outline of items to consider upon revisiting the Transition IEP. 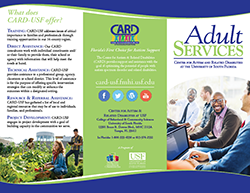 A description of the services offered to individuals, families and professional from the CARD Adult Team. A description of the Learning Academy at USF program offered to young adults between the ages of 18-25. The Learning Academy at the University of South Florida is a 30 week program designed to provide a structured employment-focused curriculum for individuals diagnosed with an Autism Spectrum Disorder, between the ages of 18-25 after they have graduated from high school. Participants engage in multiple career assessment activities to identify their strengths, skills, talents, interest and learn how they translate to work. Real life experiences and expectations through internships and peer mentoring complement the class work to provide generalization of skills and support personalized goals. For more information, please contact Susan Richmond. The Learning Academy Employment Services offers customized employment supports for individuals on the autism spectrum and related disabilities. Our services will provide meaningful, creative and individualized job development and support services to find the career that best matches a person's gifts and interests and supports him/her to secure long term and gainful employment. We have created a win-win opportunity for both clients and businesses. Providing three types of job services, we can offer people varying levels of support to create long term positive outcomes. For more information, please contact Susan Richmond. FloridaHATS provides leadership in bringing together consumers and service providers to address the complex issues associated with health care transition. Our activities are focused in 4 areas: health care financing, education and training, service delivery systems and advocacy. Project 10: Transition Education Network, is the Florida Department of Education funded entity to assist Florida school districts and relevant stakeholders in building capacity to provide secondary transition services to students with disabilities in order to improve their academic success and post-school outcomes. Project 10 serves as the primary conduit between the Florida Department of Education, specifically the Bureau of Exceptional Education and Student Services (BEESS), and relevant school district personnel in addressing law and policy, effective practices, and research-based interventions in the area of transition services for youth with disabilities. The website is full of information, publications, best practice and transition specific topic areas for all stakeholders. The Youthhood website is a dynamic, curriculum-based tool that can help young adults plan for life after high school. Although the site addresses youth directly, it is intended to be used as a curriculum within a classroom, community program, or in any setting where adults are working with youth to set goals and plan for the future. The Youthhood includes informational content, interactive activities, an online magazine, and a wealth of other opportunities for youth to connect what's important to them to their learning experiences. School-to-Adult Life - career advice for students with disabilities who are getting ready to graduate, and information and resources for families, and transition professionals who support those who are getting ready to graduate. This website portal is designed to provide information to guide decision making about a student’s transition from a Florida high school to post-school adult life. This site also features web courses, student learning games, family social networking, interactive animation, discussion board, success stories, student mini-courses, and frequently asked questions. This site provides access to recorded presentations about making transition work. Providing tools to help plan for the future. Downloadable manuals designed for planning stages in the transition years. Three manuals age 16 and 17, 18 and 19 and 20 and 21 are available. KASA is a national group of young adults with disabilities. The site provides information about KASA, reports from the field - essays about personal experiences and reports from conferences across the country, resources - a wide variety of information sheets and articles about disability-related issues as well as links to useful sites, the KASA Café which includes poetry and art from members and a forum to share ideas and let your voice be heard! This Web site contains information about living college life with a disability. It’s designed for high school students and provides video clips, activities and additional resources that can help you get a head start in planning for college. Each module includes several activities that will help you to explore more about yourself, learn what to expect from college and equip you with important considerations and tasks to complete when planning for college. to provide support and expertise in obtaining information about rehabilitation and independent living programs, services and resources that are appropriate; to understand the provisions of the Rehabilitation Act, particularly provisions relating to employment, supported employment, and independent living. PACER's TATRA Project focuses on helping families prepare youth with disabilities for employment and independent living. Projects provide information and training on transition planning, the adult service system, and strategies that prepare youth for successful employment, postsecondary education, and independent living outcomes. Site includes access to Reference Points: Transition Updates featuring resources and updates to help parent organizations, advocates and professionals better serve adolescents and young adults with disabilities and their families. Subscribers receive several short e-mail messages each week featuring resources on a range of issues affecting young adults with disabilities and their families. There is also information on legislation of importance to families with regard to transition and education. By John R. Johnson, Ph.D. of San Diego State University. This website includes an excellent transition planning workbook for families that you can download and complete with your child. The workbook covers all aspects of transition planning and includes an extensive resource list for families. The Transition Coalition provides FREE research-based online training for professionals and others involved in transition planning. There are modules in the requirements of IDEA, cultural diversity, transition assessment and working with families. These modules are developed using up-to-date research in transition, effective practices in professional development, and are tested by practitioners across the country. You must create an account to view and use the training material provided. Transition Initiatives: TransCen collaborates with several local, state, and national initiatives in order to expand opportunities for youth with disabilities as they prepare for the move into employment, postsecondary education, and adult life. Career & Employment Partnerships: A variety of TransCen’s programs connect jobseekers and employers through specific programs and partnerships. Through these innovative partnerships over 13,000 people with disabilities have secured, maintained and enhanced career opportunities. Evaluation & Research: TransCen continually engages in evaluation and research activities to complement its work to develop and implement models that promote employment and community participation. This work is designed to help inform the field about effective practice and issues that influence career and life circumstances of individuals with disabilities and other life barriers. This site contains Training Modules to supplement Transition to Adult Living: An Information and Resource Guide which is a comprehensive handbook, written for students, parents, and teachers. It offers practical guidance and resources in support of transition efforts for students with disabilities as they move from their junior high and high school years into the world of adulthood and/or independent living. The three training modules – one for service providers, one for administrators and another for families are designed to accompany the resource guide. Each module contains an agenda, a Power Point presentation with trainer’s notes, and an information sheet on how to print the information.